I could learn a lot through your post in very quick time. I have done only management analysis of CCL Products Ltd and details are as below. Promoter salary increased in FY11 even though profit was less: I feel initially when company is small promoter goes for salary hike but not high % change. Chairman is making 32lakh/p.a payment to his wife (also promoter) towards rent as third party transaction. I do not understand why this is necessary, promoter being HUF (Hindu undivided family). I understand this is very small amount compared to business turnover but needs to know from business perspective. 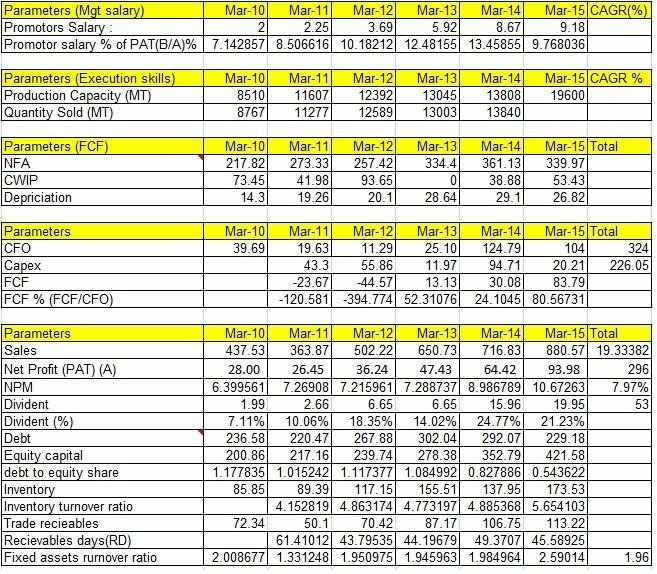 In FY11 and FY12 there is a -ve FCF but still dividend is paid. I feel this would have avoided. Every year there seems to be trend in introducing new director who is either ex- bureaucrat or present bureaucrat. I do not understand why only bureaucrat as directors? 6.37% of his salary with further resolution stating minimum salary must be 5%. Promoter shareholding is 44.73% but same person name used in different combination to make count as 6 promoters. Ex. Srishant Challa has been used thrice saying C. Srishant and Chall Srishant. What was the motive behind this is not clear to me. Kindly request you to give a feedback on my analysis and also your understanding and views on above 6 points. Many thanks for writing to me with your analysis! I appreciate the time and effort put in by you in the management analysis of CCL Products. 1) The promoter usually compensate them by multiple sources: Salary, commission, dividends, interest on the loans provided by them to the company. Promoters of different companies use different modes to compensate them. It’s advised that the investors should take a comprehensive view about the management assessment by looking at the overall outcome of all the management assessment parameters. 2) Rent payment to a promoter also falls under the preview of getting benefitted from the company as mentioned in the above parameter. Initially all the companies find it easy to operate out of family/acquaintance owned premises to keep costs lower. Once the business gains traction, then the company may start paying the market rate to the property owner. An investor should check whether the rent is as per market rate prevalent in the area or above it. If the rate is above the prevalent market rate, then the investor should be cautious. 3) Ideally, companies should not pay dividend if they are not making free cash flows. However, dividend is a major source of income for the promoters who are mostly the majority shareholders. 4) Many a times companies appoint ex-bureaucrats to help them in liasoning with different govt. departments for getting contracts etc. This practice is prevalent in companies which supply to PSUs or Govt. departments. 5) Many a times companies split the remuneration into salary and commission and stipulate the cap on any one part of this compensation structure. The regulatory cap is 10% on the total compensation given to all the directors of the company. A company needs to take central govt. approval if it wants to give higher compensation to its directors. 6) You may take direct clarification from the company whether the name mentioned repeatedly pertains to the same person or different individuals or the same person holding shares in different capacities. Thank you for spending valuable time for reply to my queries. I will post you back after getting clarification on point 2. Regarding Point 3: It looks attitude towards benefits a little suspicious because compensation also increased and amount in the form of Dividend also increase when there is no free cash flow. Regarding Point 5. Promoter has taken compensation more than cap in FY-12 to FY-14. Now where can I find that promoter has taken central Govt approval? Regarding Point 6: It’s the same person. Please let me know what will be consequences? It’s advised that if an investor is not comfortable with the promoter/management, then she should stay away from the company. Because at the end of the day, equity investing is nothing but a call/punt on the management of the company. Management is the single biggest factor that would make or break the investor’s returns. Dr. Vijay Malik I first want to commend you for sharing your knowledge with us. Your site is goldmine for beginners. You are able to explain everything in such a simple format that everything appears easy. Query: Since balance sheet presentation has changed, so I am little bit confused on how to calculate D/E ratio and current ratio (CR), probably due to non-accounting background. For calculating the debt of a company do we have to take all items mentioned in non-current and current liabilities? Noncurrent liabilities: Long term borrowings, Net deferred tax liabilities, Other Long term liabilities, long term Provisions. Should we take all items mentioned in current assets and liabilities? Similarly in current liabilities we add only short term borrowings and provisions or taken as a whole as mentioned in balance sheet. Sorry for bothering you by asking such simple question. Looking forward to hear from you. If you don’t mind can u please explain all these items included in liabilities and assets in simple terms. Finance is a very versatile field which allows users to tweak the ratios as per their preferences. There is no right or wrong way of calculating the ratio until the time the investor understands what are the individual items which are becoming part of the ratios. This is the primary reason that we notice different investors using their own preferred or custom made ratios to analyse stocks. You may try using different combinations of items as part of calculating D/E or CR and see which ratio formula works for you the best. An investor may tweak these ratios as per her preferences. Dear Vijay, retained earnings is the money which the company puts back in the business. So shouldn’t capital expenditure be deducted along with dividend paid because that’s also an expense right? 1) Capital expenditure is done by the company from the earnings that it retains after paying out dividend. Therefore, capex is not deducted while calculating retained earnings. 2) Adding depreciation and amortization (DA) into PAT takes the investor towards cash flow from operations, whereas retained earnings is a profitability figure which factors in the DA expense as part of the capital expenditure the company did in the past years on its fixed assets. DA should be deducted while calculating retained earnings and should be added back while calculating CFO. Hello sir, I have attended your workshop in Mumbai and I must say it was one of best class I have ever attended. I have many doubt sir, which I encountered after returning home. I will send you my query one by one. Right now, my doubt is related to sales growth. Sir, is it necessary to keep sales growth > 15% for past 10 years or range of 12-15% is also enough. Thanks for writing to me! I am happy that you found the workshop valuable. Choosing the criteria for selection of stocks is purely an investor’s prerogative. I would prefer the growth rate to be as high as possible unless it crosses >30% at the level the growth rates become a bit unsustainable in the long run. However, if an investor believes that a company that she has found has all other good parameters in place and is growing within 12-15% range, then she may go ahead with that company. You may ask any of your queries here. Thanks for the wonderful article! Indeed a good one. FYI, I am your big fan. What kind of information should we ask the company secretary? As a retail investor, would she entertain us? Please share your experience on calling the company secretary, if any. You may approach them for any doubt that you have after going through the annual report. I had approached Haldyn Glass Limited, where once the company secretary arranged a call back by a person in senior management who explained me their business model in a very simple and lucid manner. However, on another occasion, I did not receive the required information. Therefore, the response that you would get would differ from the company to company and within the same company from person to person. However, if the investor does not call the company, then the doubts would not be clarified at all. Sir, if there is increase in cash and cash equivalent of current asset section, is it not inflow of money rather than outflow? How it can be outflow of a fund? Increase in cash & equivalents is an increase in asset (bank balance), which can be understood as cash outflow from company to the Banks which leads to an increase in asset of bank balance. It is similar to the cash outflow from company when it buys any investment product. Investment in such products leads to cash outflow from the company and resultant increase in holding of the financial/investment product like mutual funds etc.